From the cultural city of Venice, head to the Croatian island of Cres and then relax on the idyllic island of Hvar before cruising the Croatian coast to historic Dubrovnik, a UNESCO World Heritage Site. See remnants left behind by the Romans in the medieval city of Kotor in Montenegro, explore the idyllic island of Corfu with its pristine beaches and discover Katakalon, the gateway to Olympia. 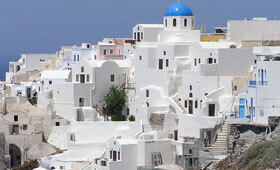 Admire the remarkable views from picturesque Santorini with its whitewashed houses and pretty streets and discover the vibrant island of Mykonos before this tall ship cruise comes to an end in the historic city of Athens. Embark Star Flyer in Venice. In 2019, visit Mali Losinj. The warm sands of Cikat Bay are an irresistible magnet for beachgoers. In the fortified town of Veli Losinj, climb the 16th century tower and hear the history of the Uskoks, warrior refugees from the Turkish invasion who fled in 1526 to the coastal islands to start new lives under Hapsburg protection. In 2020, spend the day in Cres. The heavenly scent of lavender perfumes the air in the fields and valleys around the island of Hvar. Idyllically located just off the Dalmatian coast, the island and the little port named after it have been a favourite getaway ever since the time of the Romans, the Byzantines, the Venetians and even Austro-Hungarian royalty. It was George Bernard Shaw who said, 'Those who seek paradise on earth should come to Dubrovnik.' Indeed, Dubrovnik is a treasure by any measure made more precious by its miraculous restoration. Crowned by the Minceta Tower, the 10th-century city walls are the proud symbol of Dubrovnik's colourful history. The most lush (and some say the loveliest) of all the Greek Islands, Corfu lies just a stone's throw from the Albanian coast. Nowhere is the stunning natural beauty of Corfu more evident than in the small village of Paleocastritsa, where legend says Odysseus was washed ashore to be rescued by Nausicaa. Katakalon lies on the Greek coast overlooking the Ionian Sea. It is the gateway to Olympia, home to the archaeological site where the Olympics were first held. A day at sea and the chance to relax and enjoy the comforts of Star Flyer. Please note, the reverse itinerary is a 11-night cruise with an additional day in Korcula. The Captain reserves the right to alter the itinerary to suit wind and weather conditions. Please note, the reverse itinerary is a 11-night cruise with an additional day in Korcula.